Does carpet even belong in basements? Some doubt a carpet's ability to recover from moisture. They note that even the least amount of moisture causes mold growth, leading to health problems. Others insist that carpeting is one of the best materials when basement moisture is prevalent. Low pile. High-pile (thick) carpet takes a longer time to dry out, should it get wet. The lower the pile, the faster the drying process. Cut-pile. Carpet is usually made of fiber loops that can be left "as-is," cut, or combined loop and pile. Cut pile carpeting tends to be more durable and easier to extract water from, should the need arise. Pad-less. While most people installing carpeting in basements are reluctant to give up the padding (it has the advantage of making the floor warmer), padding also acts as a sponge and traps water within and underneath it. Man-made materials. Carpet derived from organic materials (for instance, wool) will not stand up to moisture as effectively as man-made materials. Nylon, Olefin (polypropylene), and polyester are the most popular types of man-made carpet fibers. Sectioned. If you buy wall-to-wall carpeting and part of it gets so soaked that removal is necessary, the entire carpet must come out. If you buy carpet squares, though, you can excise the water-logged part of the carpet with surgical precision. Not only that, carpet squares are a DIY-friendly install. Waterproof. Some carpets are considered waterproof because they have special backings that prevent moisture from passing through. Shaw constructed a 25,000-gallon swimming pool lined with its LifeGuard carpet to demonstrate how well it stands up to water. Result: no leakage. While it may be a publicity stunt, it is a stunt that works. Shaw LifeGuard is a 100 percent waterproof carpet, which means that water may reside on its surface but it will not leak underneath it. This allows you to have a higher pile than you might ordinarily have since in the event of water leakage you only need to draw water off the surface, not underneath. Similar to Shaw LifeGuard, Tigressa H2O has a unique backing that prevents all liquids from passing through. This way, you can be assured that moisture will not find its way to your padding. Basement moisture ranges the spectrum of woes. At one end of the scale, in certain climates, it can be seen as a fact of life that must be managed. At the other end, basement moisture can be a huge issue indeed and a real estate deal-breaker. Leaks: Water leaks can come from cracks in the foundation wall, up through cracks in the floor, down through air-vents in the side of the foundation, etc. You are not always so "lucky" as to catch an active water leak in process. But even dried-up leaks can be identified by remnants such as calcium deposits and other trailings that are left behind. Moisture in the air: Even above-grade rooms have moisture in the air. Moisture-laden air inhabits many basements. Often, the source is easier and less invasive than you might fear. A displaced dryer vent hose spewing exhaust into the basement will spike basement humidity levels. Dehumidifiers are always a great idea in basements, even ones that appear to be dry. Moisture through the floor: Sure, a crack in the concrete floor will emit moisture. But did you know that even a stable, intact concrete floor can wick moisture? The "pro-carpet" side says that carpeting can be installed in the basement and will fare no worse than other types of flooring materials such an engineered wood or laminate. This argument runs that carpet has a "breathability" factor greater than other types and that even light moisture can be mitigated with dehumidifiers. Additionally, in the event of large water leaks, carpeting can be dried out quickly enough before mold/mildew develop. However, this job must be taken on by professional water extraction companies. The "anti-carpet" camp says that there are far more durable basement flooring options than carpet. Straight concrete (stained or painted) and ceramic or natural stone tile are practically impervious to water leaks or condensation—with tile and sheet vinyl running a close second. Not only does carpet get water-soaked, but its pad does, too. The argument extends to the mold and mildew that can develop in carpeting material, turning the basement into an unsafe environment. How Much Does It Really Cost to Finish or Remodel a Basement? What Is a Window Well and Why Does It Need a Well Cover? What Are Your Best Basement Flooring Options? 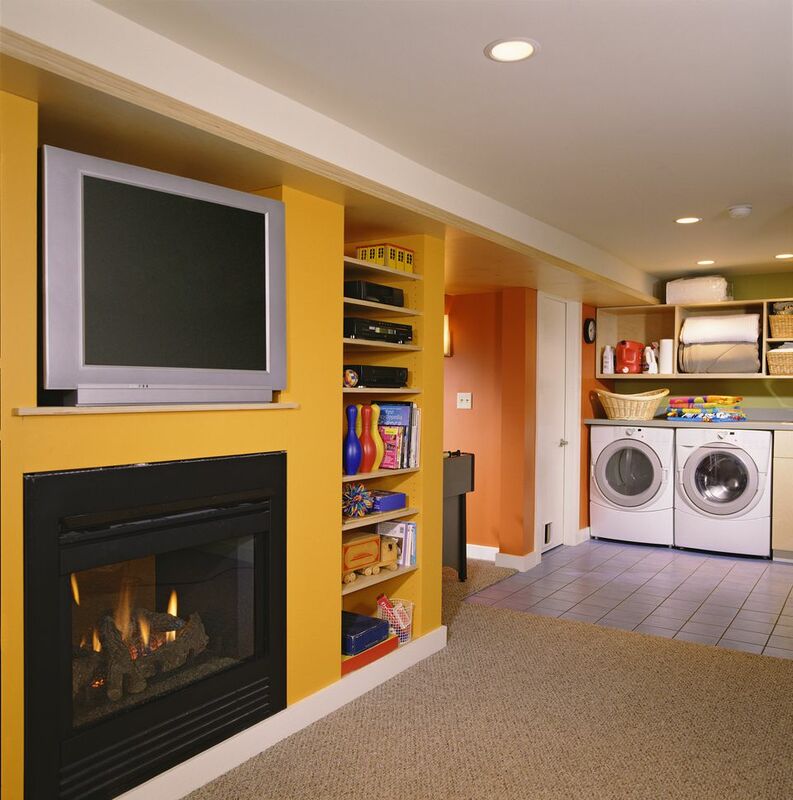 What Causes Wet Basements and What Are the Best Solutions?